Queen’s has re-affirmed its commitment to the principles outlined in the University’s Social Charter which was launched in November 2017. The Social Charter shines a light on the significant contribution made by the University’s students and staff. It also highlights the positive impact the University makes on society, local, nationally and internationally – economically, socially and culturally. The University’s Corporate Plan celebrates the Social Charter through the identification of 19 Signature Projects, chosen to bring the Charter to life. These projects range from local homework clubs to global alliances for leading-edge cancer research. Recognising and Rewarding Contributions from Students and Staff. The Social Charter was established to embody these core principles and form the basis of the University’s public engagement activity. The University aims to promote the message, teaching, research and values of Queen’s across the entire political and civic sphere in order to promote global thinking locally. 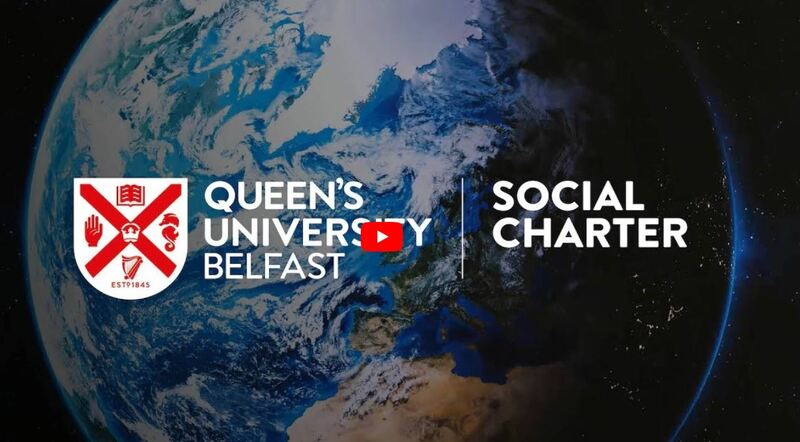 Find out about the Social Charter at www.qub.ac.uk/social-charter or by contacting the Public Engagement, Marketing, Recruitment, Communications and Internationalisation Directorate (MRCI) on telephone +44 (0)28 9097 5331 or follow them on Twitter @QUBEngagement. Media enquiries about this story to Communications Officer, Communications Office, Queen’s University Belfast, telephone: +44 (0)28 9097 5292.